Avoid These Paint Colors When Selling Your Home…. As you will recall, in my post on which colors to use to increase your sale price, I told you that Zillow’s color analysis for 2017 showed that gray or gray blue kitchens and dining rooms sold for the highest price. Some of the lowest selling homes came with red dining rooms. Red was quite popular for dining rooms back in the late 80s and early 90s, but it seems that the world has move on and away from this traditional color. 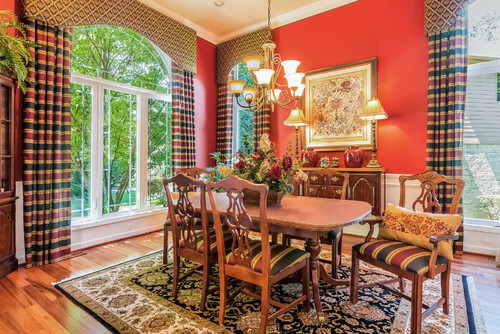 Statistically speaking, if your dining room is red, you could loose as much as $2,000. In kitchens, I know that many of you love a sunny yellow color. I get that. Sometimes, you just want the main hub of the house to be a lively, cheerful place. Unfortunately, yellow just doesn’t go over that well with the vast majority of buyers. This color can cause your home to sell for up to $800 less than other colors. That may not seem like much, but the difference between the loss with this color and gains with a gray paint can be as much as $2600. This image caught my eye, not just because of the variety of patterns, but also because of the vibrant lime green. If you missed it, Pantone named greenery as their color of the year for 2017. This made me think of that color choice quite a bit. So, it just goes to show that trends may not translate so well to real estate value. In addition to paint colors, you may want to avoid using a lot of wallpaper, especially loud or busy wallpaper. Given that wallpaper is one of those things that people either completely love or completely hate, you run the risk of alienating a lot of potential buyers when using it. If you do want to install wallpaper, go with something more neutral, and remember, less is more. For suggestions on how to use wallpaper in a manner that is pleasing to most, read my post here. Speaking of busy, you probably want to avoid busy paint colors, as well. This room would capture a larger portion of the buyer segment if they had stopped with just the black and white theme. As it stands, with the black and white, and red and yellow, this room has a lot going on, and is likely to turn off many buyers. Even if you love this rooms design, remember that red and yellow are very personal in taste. (If you are a lover of black paint, use it carefully, but know that it can be done, under the right circumstances). Most buyers prefer a bedroom that is relaxing. Blue tones are good for that. Soft neutral grays are also a good option for bedrooms. However, if you want to go with a different color, try to stay as close to neutral as you can, and go for soft understated tones. (FYI – the worst color for bedrooms, according to Zillow, is pink). In bathrooms, the one major no-no is to do nothing- i.e, white. Bathrooms with white paint saw the biggest loss in sales, according to Zillow. In fact, the loss was up to $4,000 for these forgotten rooms. Whereas, power blue bathrooms had increases up to $5000. That is a difference of about $9000! If you want to see the biggest bang for your buck, then this is where it is. This bathroom (above) is quite nice the way that it is, but imagine the walls with a soft color. Anything, other than white. You can see how the white sort of makes the room look old and tired. A fresh coat of a soft blue or mint would really pep it up. This image brought to mind Marie from Breaking Bad. If you are a fan of the show, then you know what I mean. If you have never seen it, suffice it to say that one of the characters loved the color purple and used it religiously throughout her home. Although you may love purple just like Marie, it is probably best to not have it in the living room when trying to sell your home. According to Zillow, you should also avoid blues and pastels. Living rooms and/or family rooms do best in neutral colors. This is usually the first room that the buyer will see, and it sets the whole tone for the walk through. In most cases, the buyer plans to repaint the house anyway. So, you may wonder why you should even bother. Well, anything other than a neutral tone can cause a negative reaction, which can effect your bottom line. As I said before, color choices are very subjective. However, you can rely on statistical evidence to help you with selling your home. Yes, your current color pallet may be beautiful, but ask yourself, “will this appeal to everyone”? If not, it may be better to have something neutral. Sure there may be someone, somewhere out there that would love your home as is, but do you really want to wait around for that person to discover your house. Less interested people generally means a lower final sale’s price. After all, it is the largest portion of the buyers’ market that you want to capture. Increase Your Home’s Sale Price With These Paint Colors!